Wes McClure talks about when students were first allowed to paint graffiti in what eventually became known as the Free Expression Tunnel. 00:00:06.611 to the other with a railroad through the middle. But I recall the term “Free Expression Tunnel” being used. 00:00:15.156 Maybe it was used in support of the idea of it or something, I don’t know, before it was a real name for it. 00:00:20.727 But it was something that students felt was an important thing because it was free expression, but it needed to be sort of within certain boundaries. 00:00:34.874 Besides, what harm is there? It’s a concrete tunnel under a railroad track.I mean, come on. Give me a break. 00:00:42.679 You can’t say: oh, we can’t do graffiti, or whatever. Of course this was long before the idea of graffiti as art, long before that, and tagging things and so on. 00:01:09.208 way in having responsibility for that. So I think it was important, but it wasn’t protests or any of that sort of thing. 00:01:15.579 It would be just sort of typical legislation and standing up and saying: we think this should happen. 00:01:19.184 Interviewer: What was the attitude of administration? 00:01:24.654 Wes McClure: Well I think it depends on what you mean by “administration,” because the administration goes all the way down from the chancellor to the physical plant. 00:01:41.139 Our idea was: paint there and then you don’t paint next door. This video is an excerpt from a longer interview. Contact the Special Collections Research Center to request the transcript of the full interview. 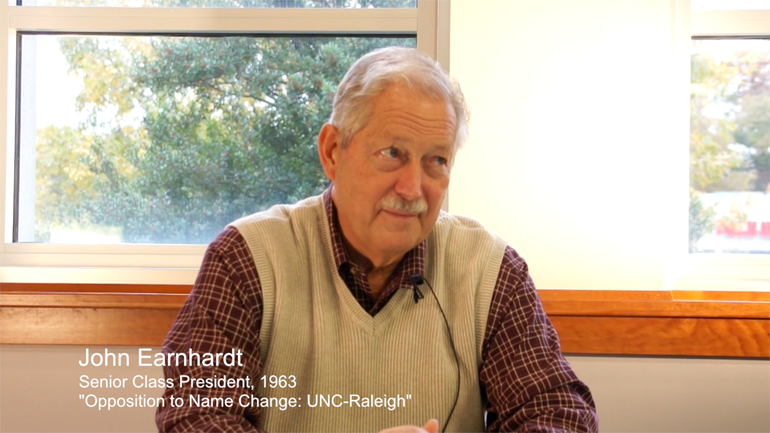 John Earnhardt recalls student opposition to the proposed university name change to University of North Carolina at Raleigh. 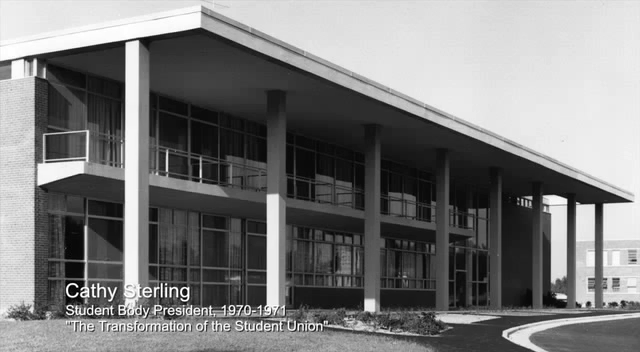 Cathy Sterling recalls the response of universities nationwide to the Kent State student shootings and discusses the development of the Peace Retreat on the NC State campus in May 1970. Richard Gusler describes NC State's reaction to the Cambodian Campaign during the Vietnam War and the 1970 campus Peace Retreat. Cathy Sterling reflects on what she saw as the shift of the student union from being a group of students run and supported by themselves to being a building on campus supported by student fees collected by Student Affairs. 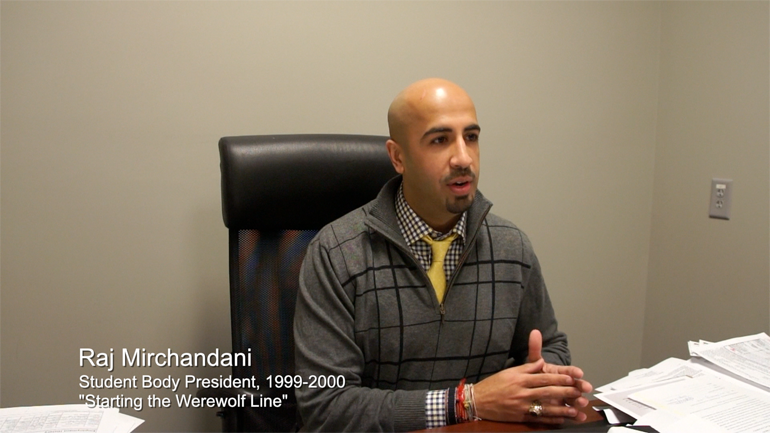 Rajesh Mirchandani recalls the formation of the Werewolf bus line from idea to implementation. 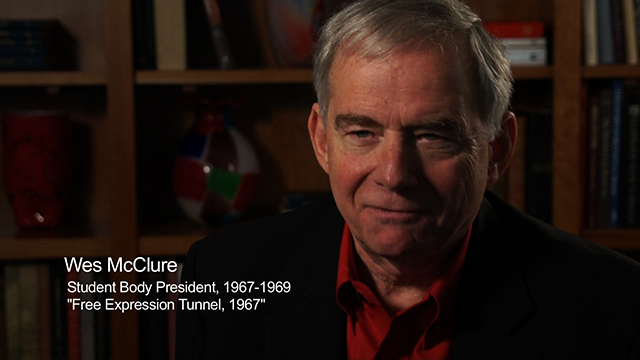 Ed Stack recalls the involvement of student leaders in the development of a student honor code in the early 1990s. 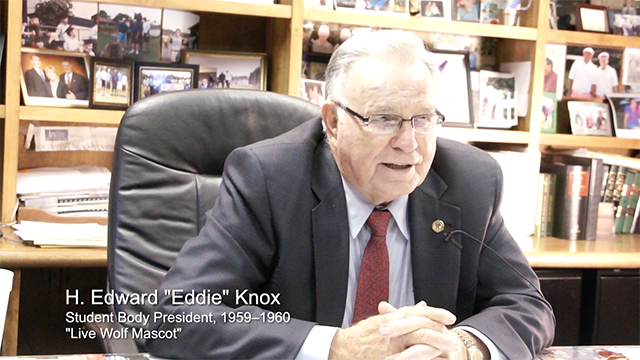 Eddie Knox recounts his efforts to bring a live wolf mascot to NC State. 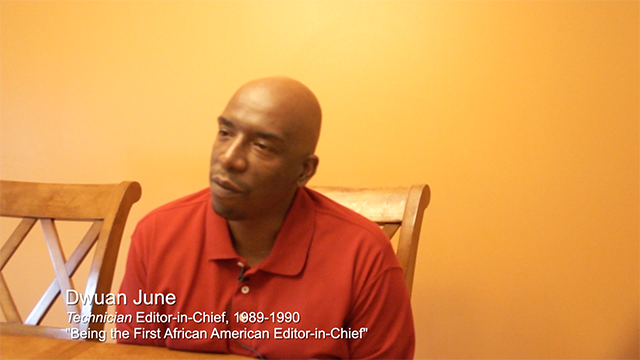 Dwuan June recalls establishing his legacy as the Editor-in-Chief of the Technician. 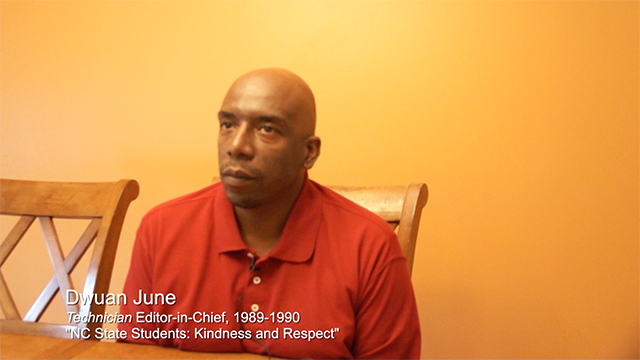 Dwuan June describes how the diversity of NC State students allows them to be kinder and more respectful to others. 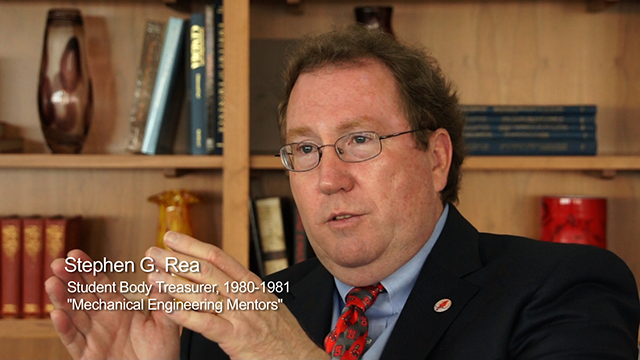 Stephen Rea recalls the influences of his mentors in the mechanical engineering department at NC State, including Dr. Todd Pierce, Dr. Lloyd Griffith and Dr. Peter Corson. 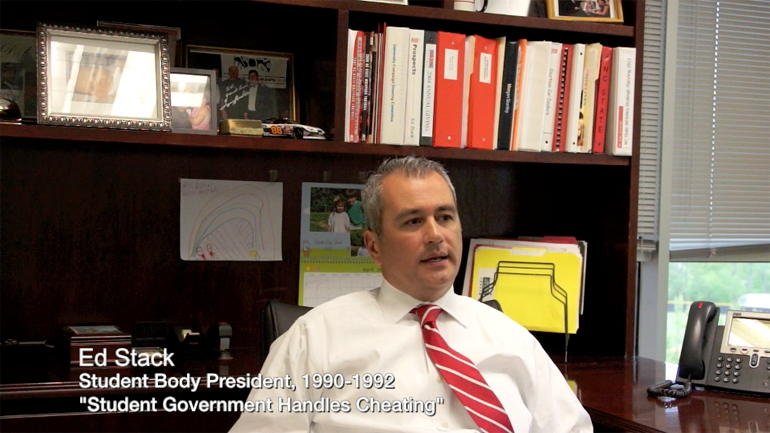 Kelly Hook explains how students, particularly Student Government leaders, respond to changes in university leadership, specifically the installation of Randy Woodson as NC State's chancellor. Brigadier General Jennings reflects on the lesson of perseverance and its impact on his academic achievements at NC State. Chandler Thompson discusses being a part of the founding of the Kappa Delta chapter at NC State in 2011-2012. Andy Walsh reflects on the idea for a concert for students at the end of campus Welcome Week. James B. 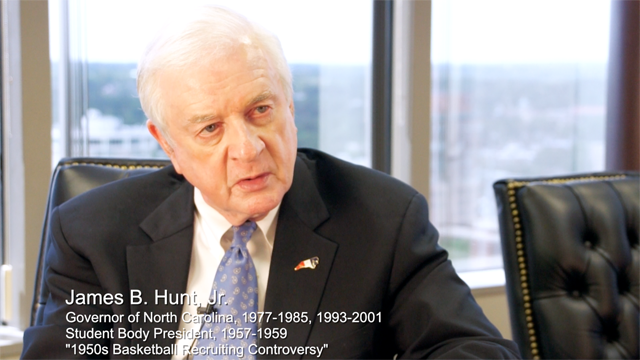 Hunt, Jr. reflects on what he learned from the chancellor and other faculty leaders during the 1950s basketball recruiting controversy. 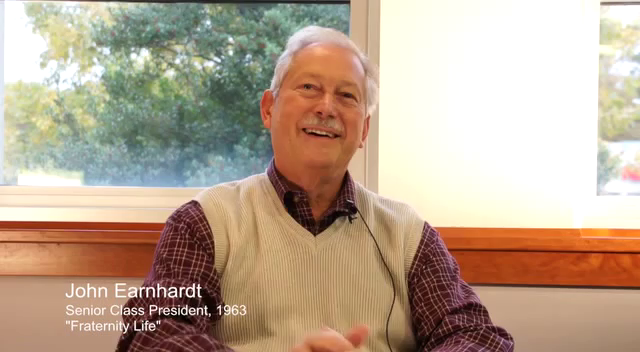 John Earnhardt discusses his duties as president of the Class of 1963. He primarily developed means for informing his classmates of where they needed to go on campus to get help. Kelly Hook reflects on her experiences living on campus (Carroll Hall) as an NC State student. 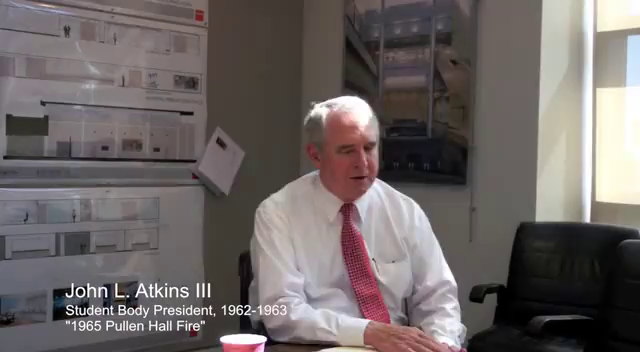 John Atkins recalls the atmosphere on campus before and after an arsonist set a fire that destroyed Pullen Hall in 1965. 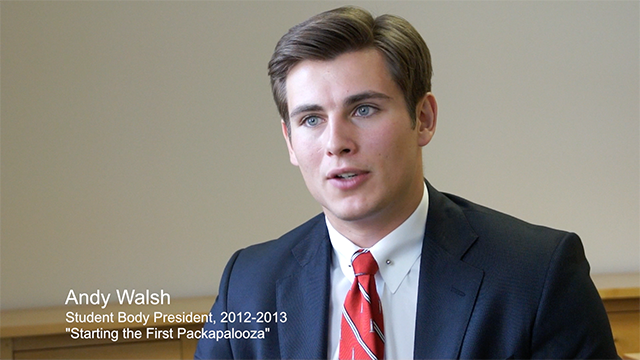 Andy Walsh recalls the Roll Pack incident after NC State upset the no. 1 seeded Duke Basketball team in 2013. 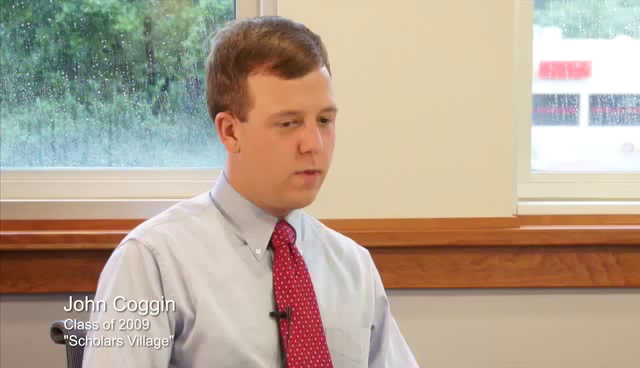 John Coggin discusses what it was like to live in the Scholars Village as an undergraduate. 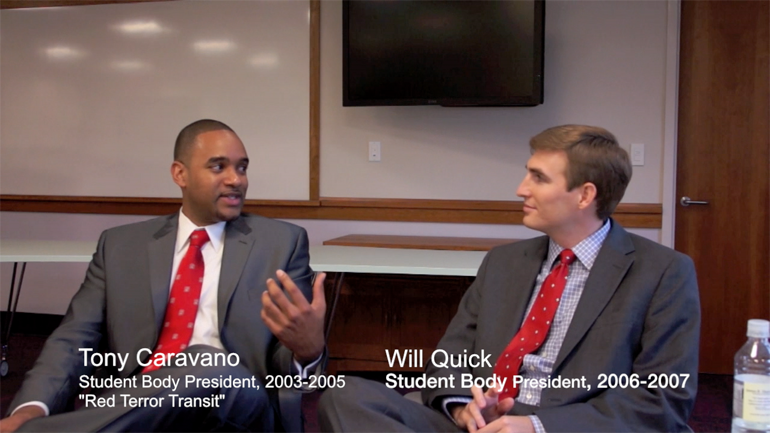 Tony Caravano and Will Quick describe the development of the Red Terror Transit bus line from idea to implementation. Judge Ronald E. Spivey describes initiatives to make Student Government more accessible and visible and to foster two-way communication between it and students. 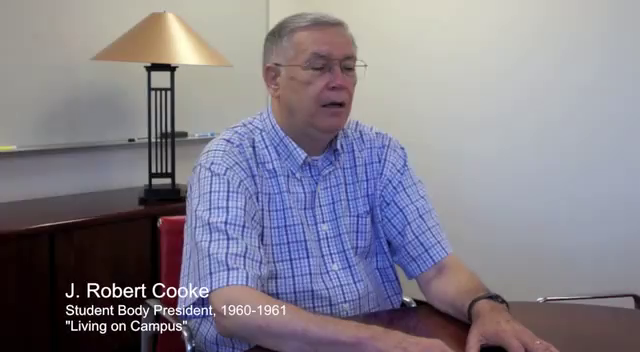 J. Robert Cooke discusses living in dormitories as a student. He lived in Bagwell, Turlington, and Bragaw residence halls, and the last had just opened. Judge Ronald E. Spivey describes his successful campaign to extend the hours of the Carmichael Gymnasium past 9 p.m.
T. Greg Doucette discusses the implementation and operation of the first fee referenda in the early 2000s. 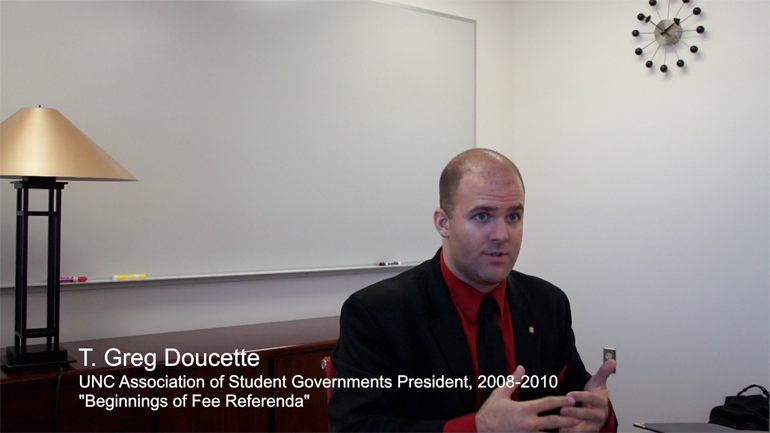 Wes McClure discusses the reaction of NC State University's Student Government to the Speaker Ban law. 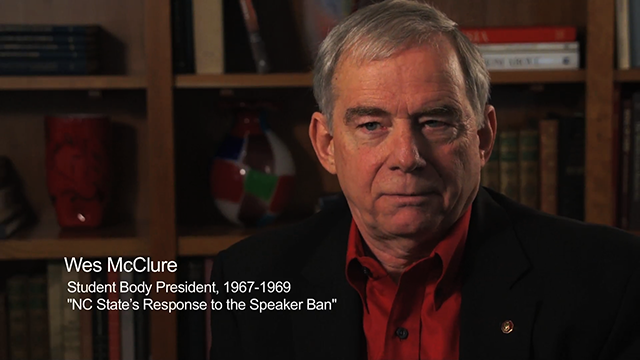 The Speaker Ban was enacted by the North Carolina General Assembly in 1963, and it forbade speaking at the state's public universities anyone who was a member of the communist party or who advocated overthrow of the U.S. government. The law was declared invalid in 1968. 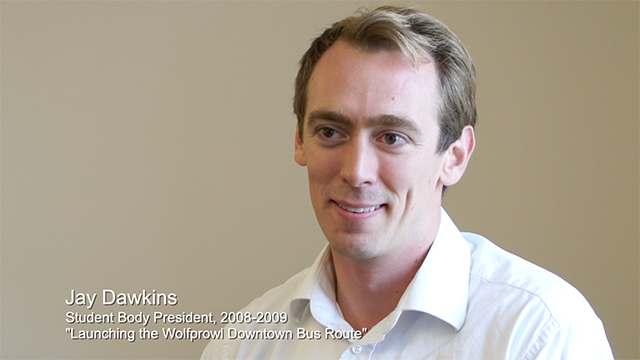 Jay Dawkins remembers the events leading up to the foundation of the Wolfprowl bus to Downtown Raleigh and it's inaugural trip. 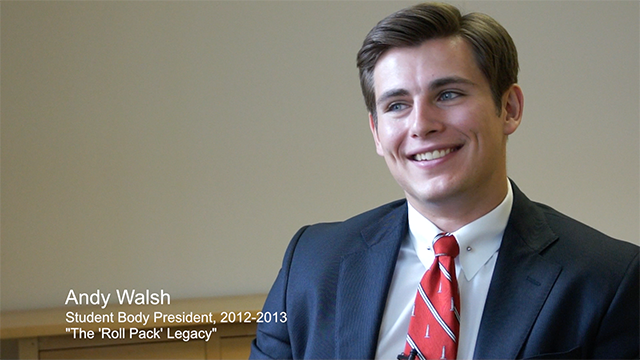 John Earnhardt discusses balancing fraternity involvement with his studies as a student at NC State. 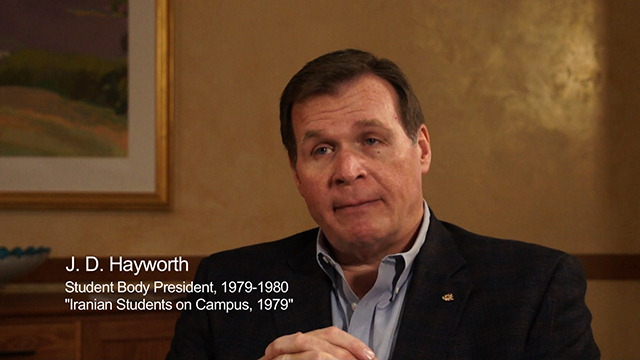 J. D. Hayworth recalls the 1979 hostage crisis in Tehran and the measures taken to ensure the safety of Iranian students attending NC State. In the late 1970s students were caught scalping ACC tournament tickets. 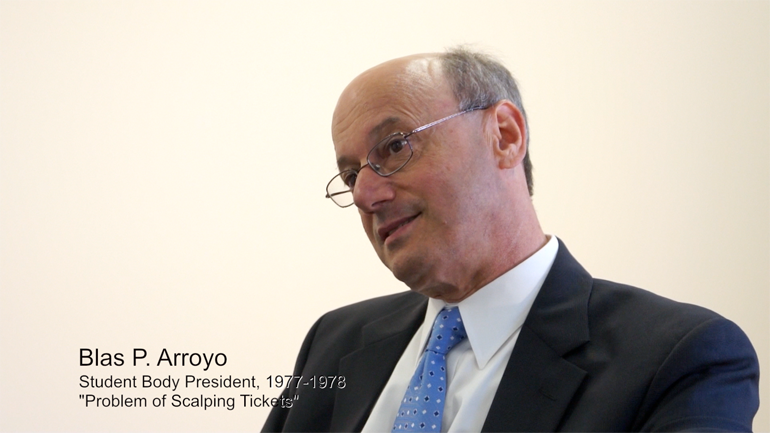 Blas Arroyo discusses a Student Government measure to develop an anti-scalping policy that conformed to state law. 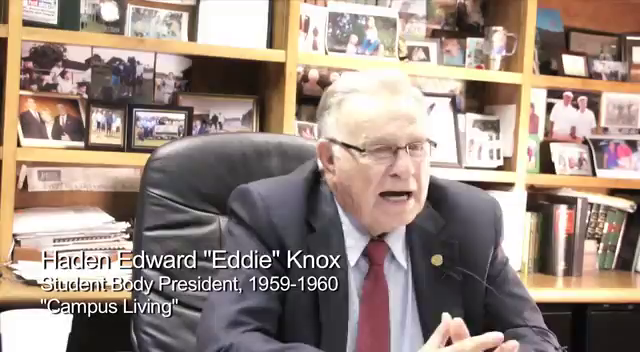 Haden Edward "Eddie" Knox discusses living in an apartment while an NC State student, and he mentions that he later lived in Vetville. Judge Ronald E. Spivey remembers the assistance given by Banks Talley, Associate Vice Chancellor of Student Affairs, in assuring a snack bar in central campus would remain open and available to students. 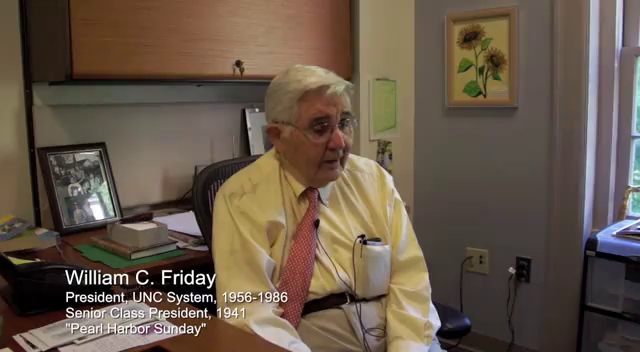 Brigadier General Jennings remembers the leadership of his mentor, Dr. Thomas Stafford. 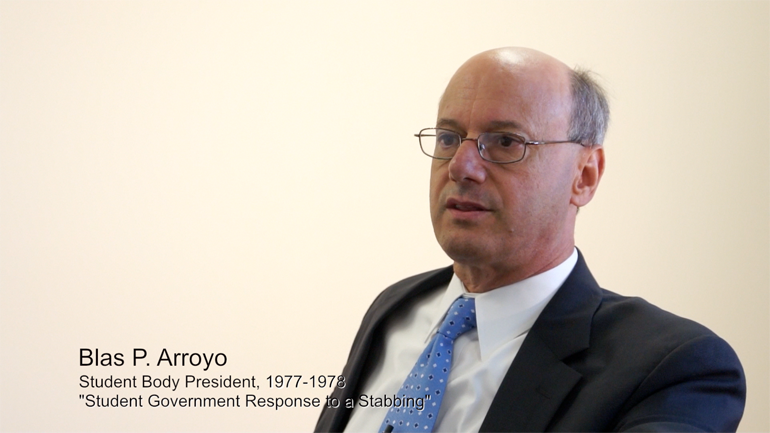 Blas Arroyo discusses the student government response to a stabbing on campus. 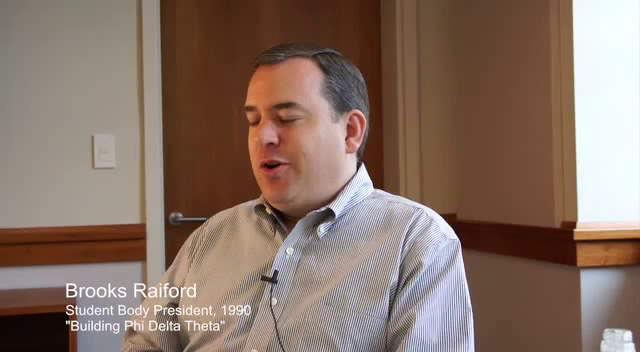 Brooks Raiford recalls his participation in the founding of the NCSU chapter of Phi Delta Theta and the challenges associated with establishing a new fraternity. Stephen Rea recalls his participation in the American Society of Mechanical Engineers at NC State and chairing the most active chapter in the Southeast. 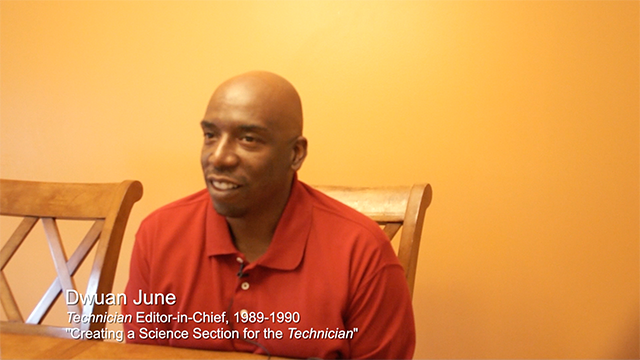 Dwuan June describes establishing "Frontiers," the Technician's first science section. Brian Nixon describes his camaraderie with Student Body President Kevin Howell and how he was recruited in the 1980s to run for student body treasurer, his first position in student government. 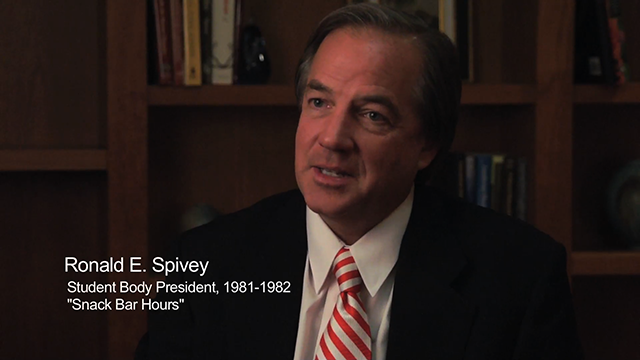 John L. Atkins III discusses student complacency in campus engagement. Jay Dawkins recalls the camaraderie amongst NC State students while attending a Unity Rally against hate speech in 2008. 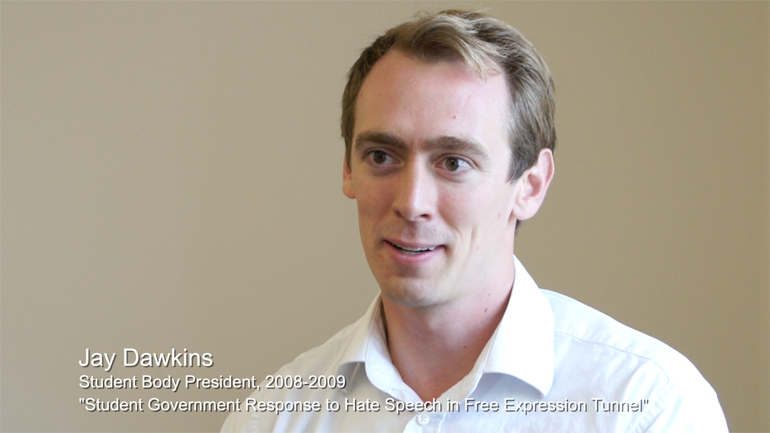 Jay Dawkins recalls campus response to hate speech written in the Free Expression Tunnel after Barack Obama was elected president in 2008. 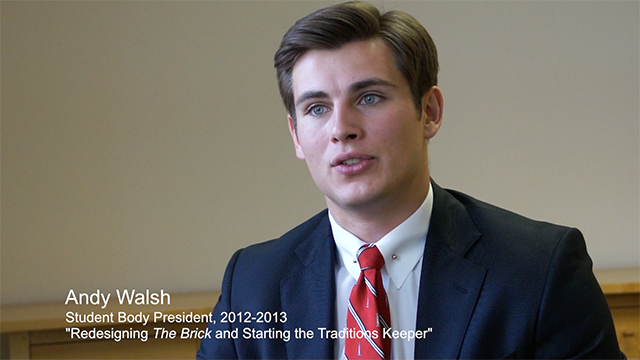 Andy Walsh recalls his role in revamping The Brick and starting the Tradition memento keeper. 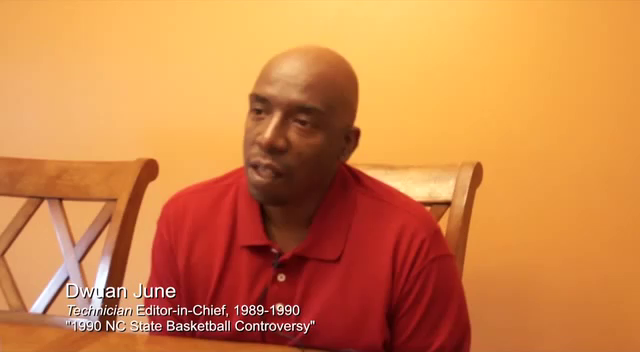 Dwuan June discusses the period he served as editor of the Technician, 1989-1990, when the basketball controversy occurred at NC State that resulted in the firing of Jim Valvano. He talks about negative reaction by some students to the newspaper's coverage. 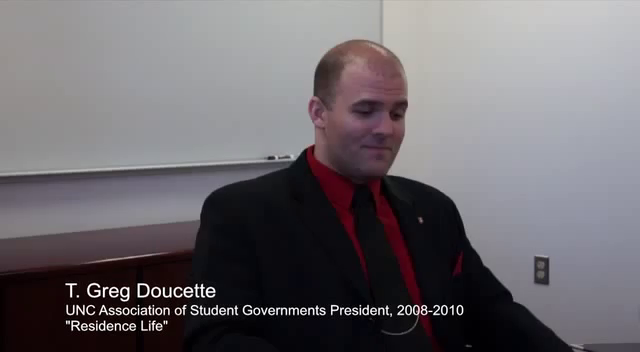 T. Greg Doucette describes his experiences living on campus as an NC State student. 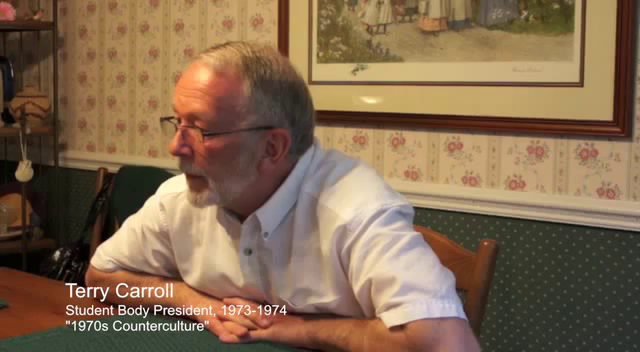 Terry Carroll discusses the 1970s counterculture and how the Vietnam War affected students' lives on campus. 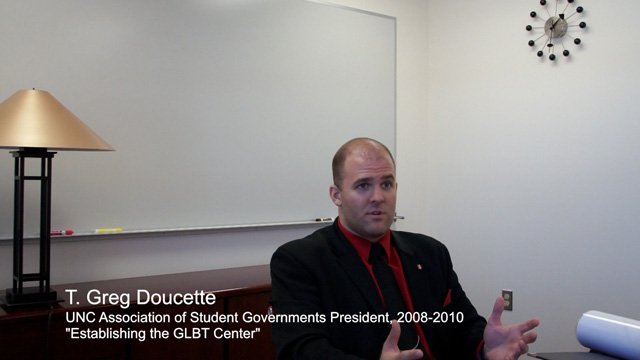 T. Greg Doucette recalls discussions in the early 2000s which eventually led to the establishment of the GLBT Center. 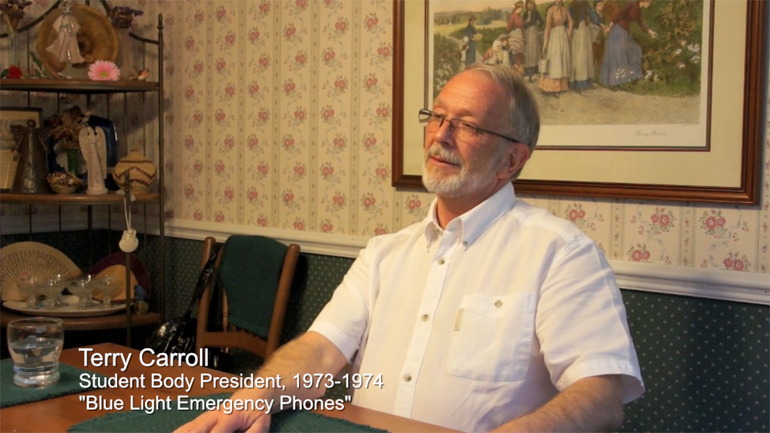 Terry Carroll discusses the blue emergency phones. Ed Stack recalls the division on campus during the 1990 NC State Basketball Controversy. 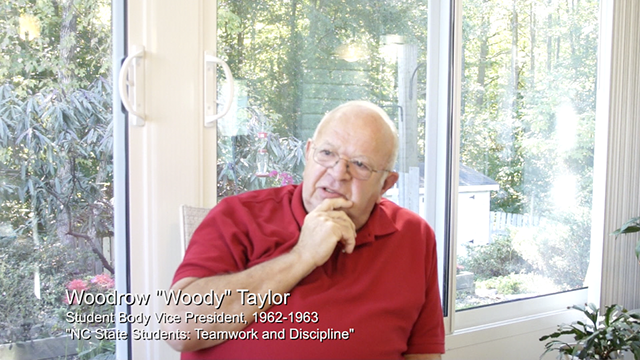 Woody Taylor describes learning teamwork, time management, and self discipline as an NC State student. 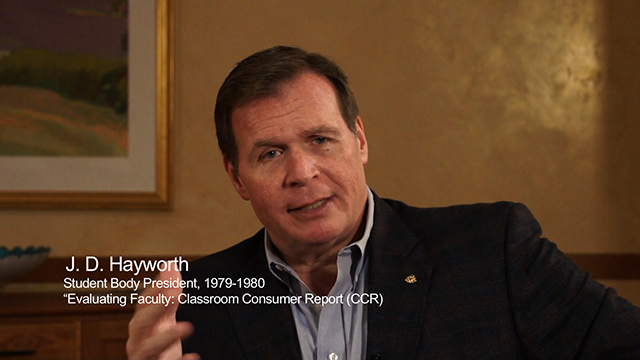 J. D. Hayworth describes implementation of the Classroom Consumer Report when he was student body president. The CCR was a student evaluation of faculty. Andy Walsh recalls the challenges and triumphs of bringing a live mascot back to NC State. Chandler Thompson talks about being a Wolfpack fan as her favorite memory of her time at NC State. Brigadier General Jennings describes the Alpha Phi Alpha service requirements, and he talks about Dr. Augustus Witherspoon, one of his most important mentors. 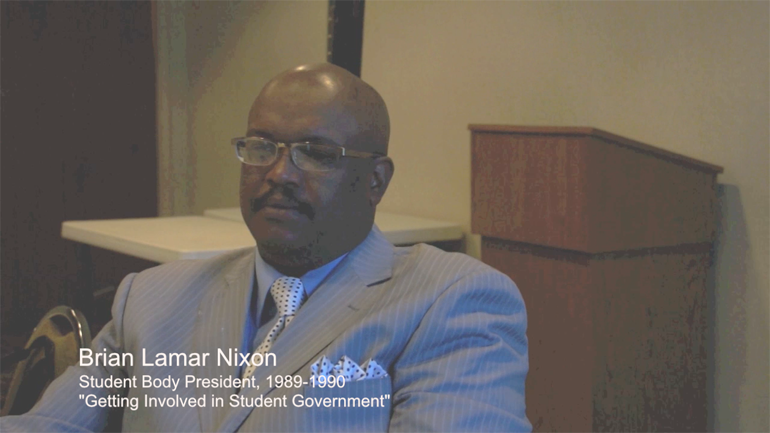 Brian Lamar Nixon discusses that as NC State student body president he set up particular evenings for college administrators and student government leaders to be available at university dining facilities for students to come ask questions while they ate their meals. Clyda Lutz describes her responsibilities as the president of the College Union and recalls the cultural programs the Friends of the College brought to NC State. 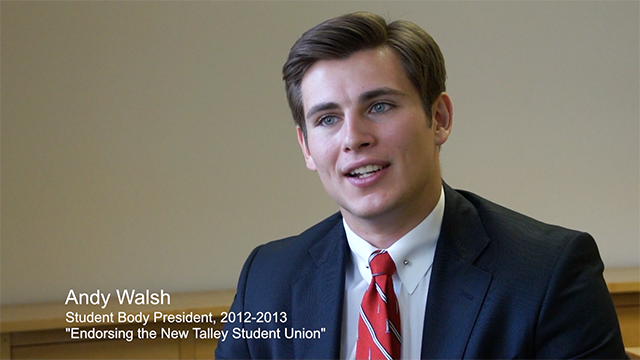 Robert Andrew "Andy" Walsh recalls the his first vote as a student senator and the controversy surrounding the new Talley Student Center fee referendum. 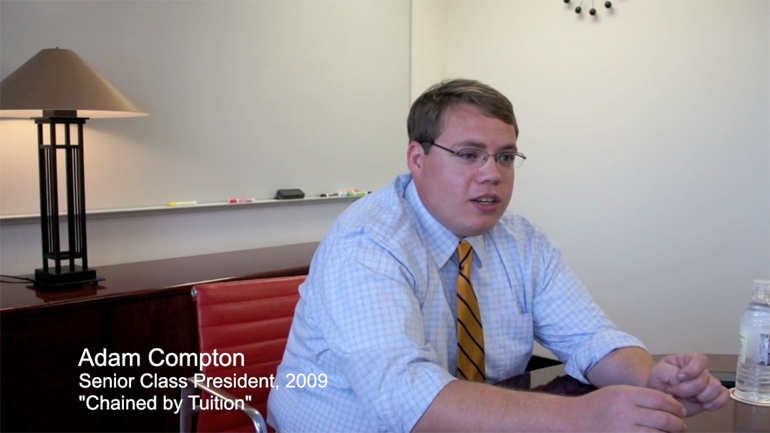 Adam Compton describes the "Chained by Tuition" campaign organized by student government and brought before the Board of Trustees. 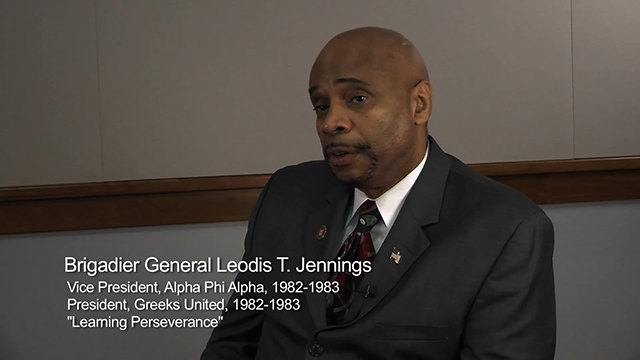 Brigadier General Jennings recalls the challenges faced by African American fraternities before they had houses at NC State, and he remembers the pride that the Alpha Phi Alphas felt once they had a one. 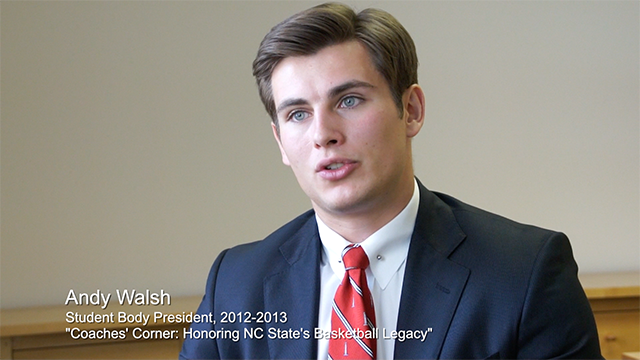 Andy Walsh recalls his role in founding Coaches' Corner, a sculpture memorial to NC State's basketball legacies. 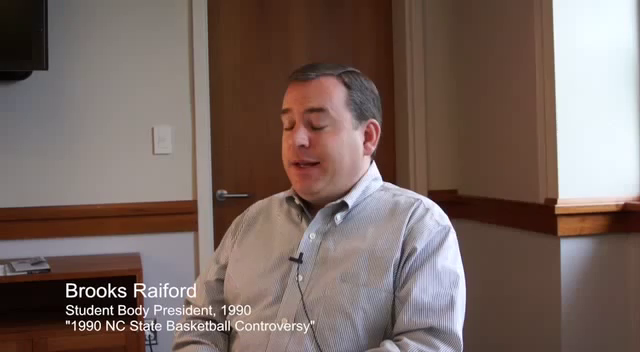 Brooks Raiford discusses the 1989-1990 basketball controversy at NC State that resulted in the firing of Jim Valvano. 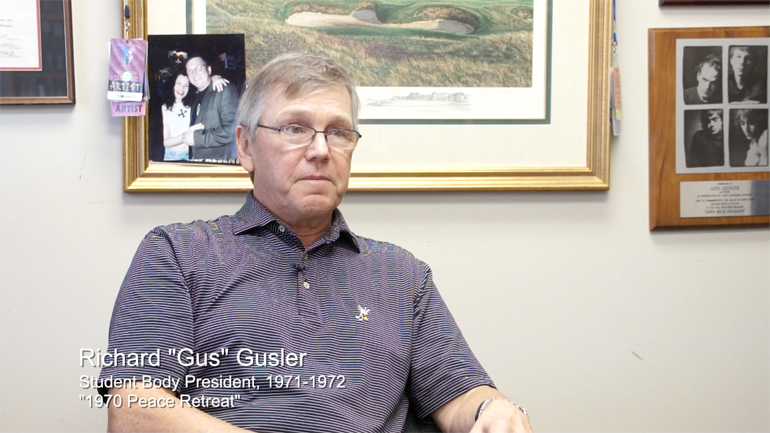 He recalls his response as a Student Senator, which he remembers was unpopular with many students. 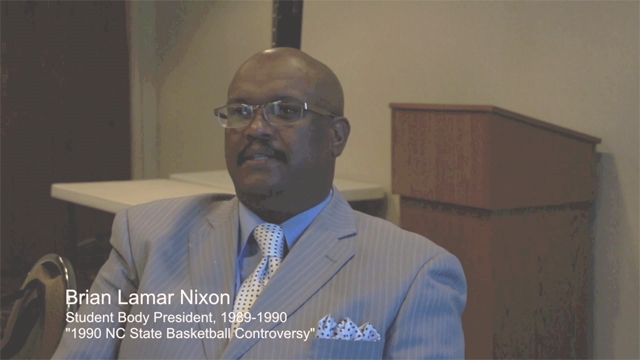 Brian Nixon recalls the 1990 basketball controversy, visiting Coach Valvano in his home and speaking with members of the team. William Friday discusses the challenges of campus unity amongst schools in land grant colleges and recalls developing NC State's spirit of unity in the late 1930s and early 1940s. John Earnhardt recalls growing up in a rural farm community and how Engineer's Council exposed him to new programs and career opportunities. Eric Moore discusses life in the dorms during his first year at NC State. 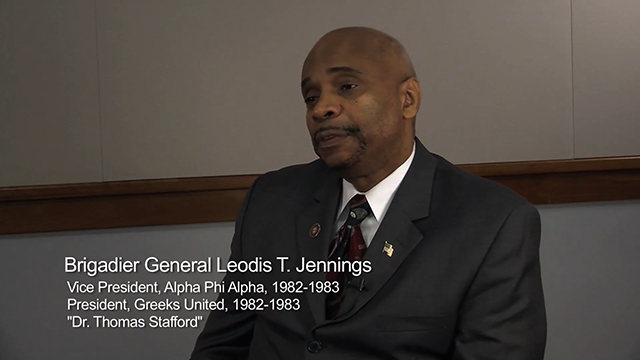 Brigadier General Jennings describes his involvement as the president of Greeks United, an organization that brought together under a shared mission and values all of the African American fraternities and sororities at NC State. 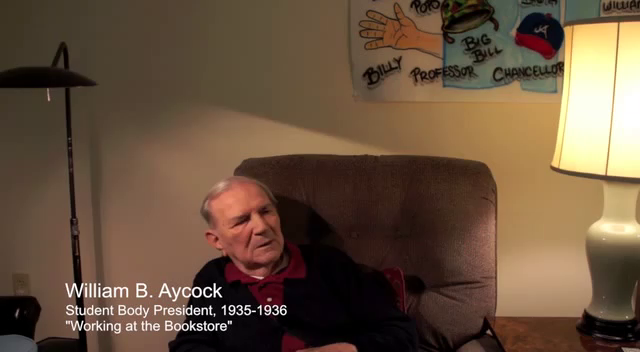 William B. Aycock discusses working at the NC State bookstore while a student. In the first year he worked in the part that served sodas to other students, then he worked in the part where students bought books. 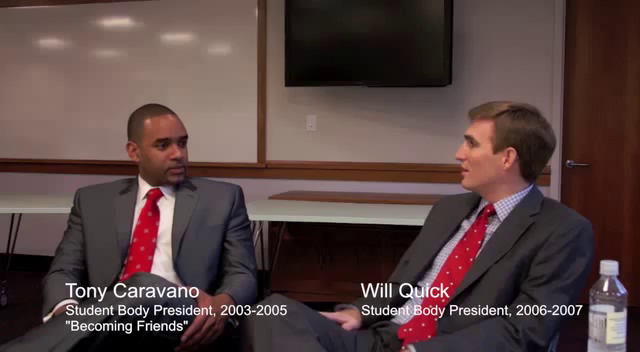 Will Quick and Tony Caravano tell how their friendship began at a Student Government event Will's freshman year. 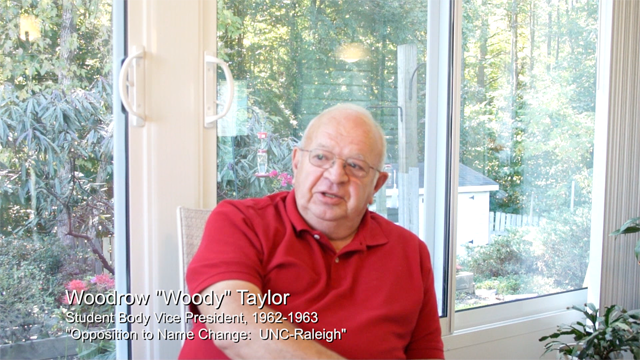 Woodrow Taylor recalls student opposition in the early 1960s to attempts to rename NC State as "the University of North Carolina at Raleigh." 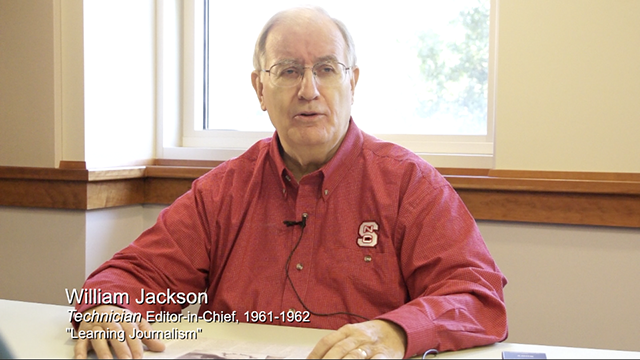 During the year Jackson was editor-in-chief, a faculty member guided Technician staff on seeking news and writing articles. 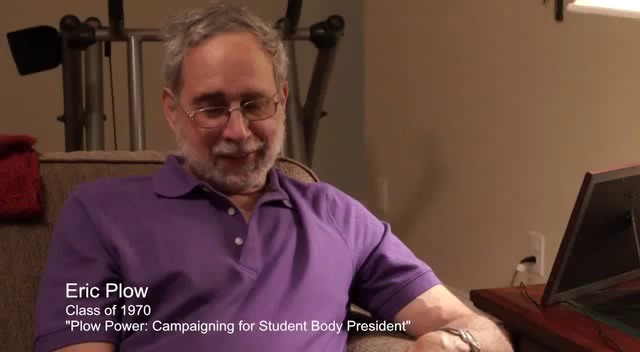 Eric Plow describes his campaign for student body president in spring 1970. Plow won the initial election, however the Elections Board ruled the election results invalid. 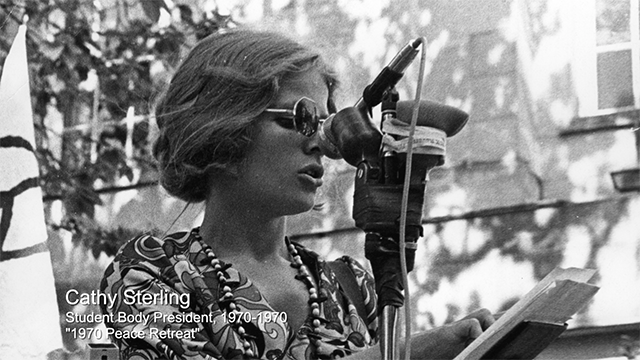 He later lost the election to Cathy Sterling, NC State's first female student body president. 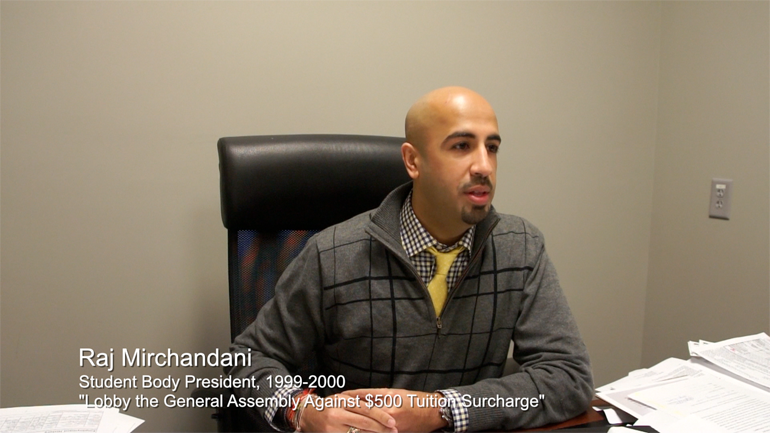 Rajesh Mirchandani recalls being a voice for students opposed to a proposed $500 tuition surcharge and lobbying against it. 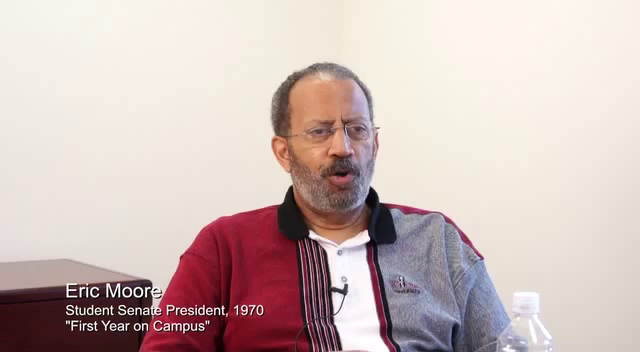 Eric Moore describes the influence of student groups, including the African American Coordinating Committee. 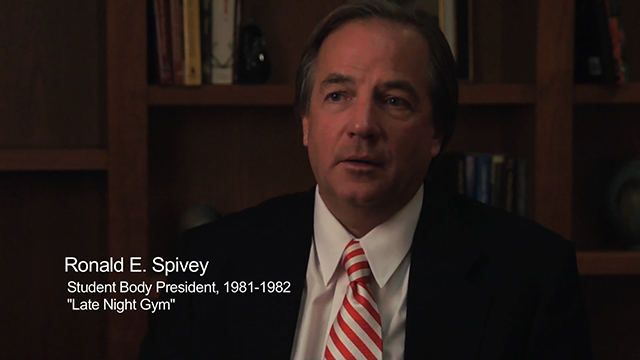 Judge Ronald E. Spivey reflects on his engagement with the NC State Board of Trustees and his excitement in meeting members like Roy H. Park. 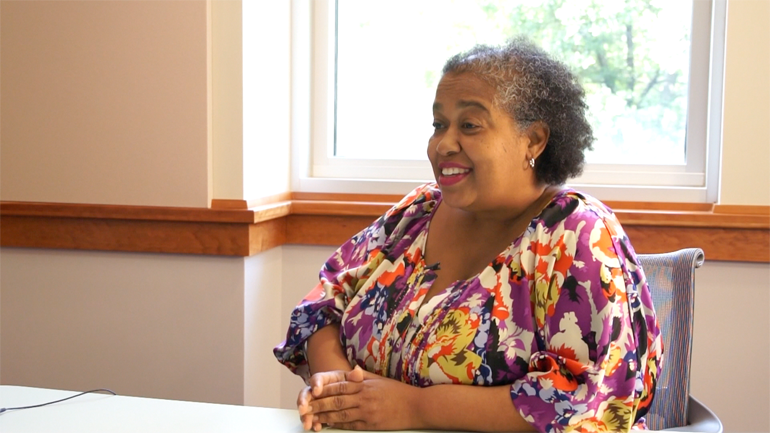 Toni Thorpe reflects on the spirit of the NC State students she mentors. William Friday recalls his reaction to the attack on Pearl Harbor. Friday also discusses how NC State contributed to the war effort and his general thoughts about the war stating, "War changes everything." 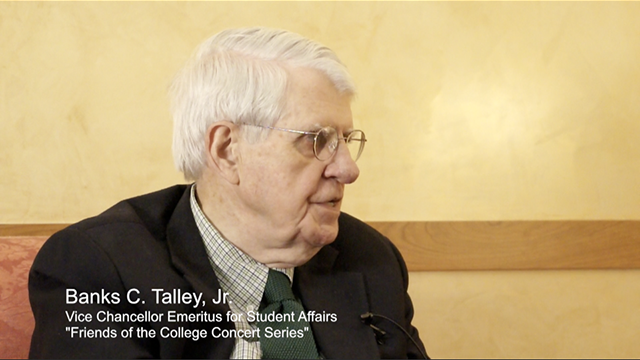 Banks Talley Jr. recalls the numerous world-renowned musical acts who performed on the NC State campus from the 1960s to the 1980s as part of the Friends of the College concert series. Are you a former NC State student leader who would like to contribute your story? If so, please contact us.